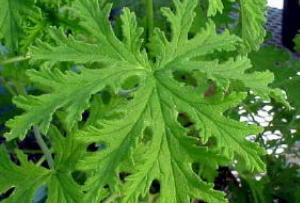 Name: Citronella Geranium "Mosquito Plant"
Soil: Well drained soil is ideal with an area of good air circulation if possible. Exposure: Full sun of 6 to 8 hours a day. Description: Annual which can grow to about 2 ft. This plant has a distinctive citronella fragrance. The Citronella plant makes a great garden plant or indoor/outdoor container plant for your patio or sun porch. To bring out the fragrance, rub or crush the leaves. Care: It does not tolerate frost and must be planted after all danger of frost is past and then dug up before the fall, if keeping. Geraniums will be stunted and yellow if lacking a good source of nitrogen in the soil. Water adequately near the soil surface and remove any old leaves that are yellowing.